Iron connecting rods can be used with 4-wheel and 2-wheel, of course, from a small radio control engine to a large plunger pump. Forging iron to casting iron can be used for our connecting rods. Gun metal is an alloy of copper and tin and it is generally composed of 90% copper and 10% tin. Gun metal was used for the cannon barrel because of its tough character. Because gun metal is easy to work with a casting and excellent in anti-abrasion and anticorrosion, a gun metal connecting rod is used for a plunger pump and air compressor. Titanium is strong, light, and excellent in anticorrosion metal. The specific gravity of titanium is about half of iron and the strength is equivalent to steel. Furthermore, the stable oxide film provides excellence in anticorrosion, and it especially shows perfect anticorrosion against sea water. 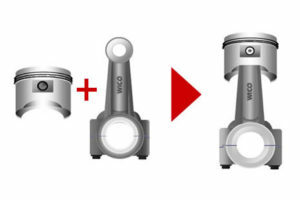 Because the material is expensive and difficult to process as a connecting rod, the application is limited to racing or luxury cars. We mostly use A383.0 (ADC 112) for Aluminum die cast material which is used for general purpose engine. If you want to improve abrasion resistance, you can increase silicon content. Then the material will be harder and the abrasion resistance will be improved. There is a problem with machinability reduction by increasing silicon content in the material. However, we can propose a special material with abrasion resistance and machinability by using smaller silicon crystals. We can do special processing on the sliding surface of big and small end bore walls for improving roughness and maintaining lubricant quality. If you want the strength of aluminum, you need to use forging material. There is a forging material used for diesel engines which has better character than used for gasoline engines in high temperature and high load. You can reduce the process by reducing the processing area, because after aluminum powder molding, you get sintered forging material which is superior to conventional forging material in dimensional accuracy. It is possible to mold the unity structure without defect by agitation powder particles. If you use aluminum die casting material which is excellent in mass production, the inner quality can be improved by PF (Pore Free die-casting) method and heat-treatment. 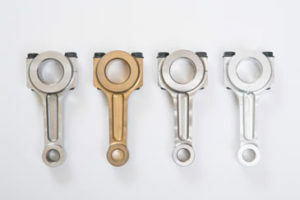 Take advantage of our 80 years of specializing in making connecting rods. We can also make aluminum parts for automobiles. It is our company policy to handle the entire manufacturing process, including material choice, processing & surface treatment. Our connecting rods are available in: aluminum forging, die casting, gravity casting, low pressure die casting, sand casting, and lost wax materials. No troublesome delivery adjustment nor sub-assembly! Please ask us about delivery adjustment for piston and connecting rod manufacturer. 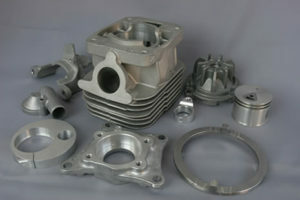 We can supply a piston and connecting rod assembly by single purchase order. You can reduce your process by delivering the part into the assembly line.